For us, the vineyard is a living thing, a life that we want to experience. Tradition and discipline. Lightness and passion. Care for the landscape, art and community. Sustainability and experimentation. With a pop art stroke and a carefree touch. Since 1956, Michele Chiarlo has been vinifying the essence of Piedmont, loving and developing the most incredible wine region in the world. 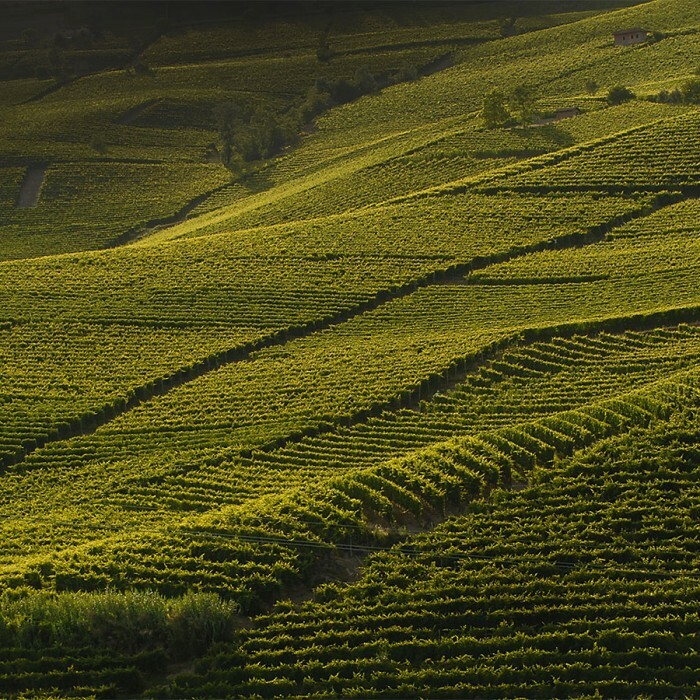 We grow 110 hectares of vineyards between Langhe, Monferrato and Gavi, the finest crus while fully respecting the ecological criteria, the terroir and their expression. I convinced my father to enrol me in the oenological school of Alba on one condition only: to always be promoted. Pietro Chiarlo was born into a farming family in Bubbio, in 1898. As an adolescent, he worked as a farmhand and then the winery in Canelli, where he was assigned to washing the muslin bags used to filter Moscato. After a period in Abyssinia working as a haulier, Pietro returned to Calamandrana determined to invest in the estate and production of wine. With brother Felice, he tilled the lands, breaking the soil by hand to replant the vineyards. The wine, he senses, is the future of the Piedmont hills. Meanwhile in 1935 Michele Chiarlo was born, the first-born son of Pietro. Following middle school, Michele succeeds in enrolling in the winemaking school in Alba «provided he is always promoted». His class mates are the future protagonists of Italian winemaking: Renato Ratti, Ezio Rivella, Franco Ziliani, Giuliano Noè and Giacomo Tachis. The passion for his land and viticultural experience take Pietro Chiarlo to the leadership of the Cooperative Winery of Calamandrana, as president. A role he would hold until 1980, contributing to the development of viticulture and oenology in Piedmont and Italy. In 1956 Michele Chiarlo begins his adventure as a producer of wine. In years of hardship and misery, he understood that the road to the emancipation of the Piedmont hills was to be found in quality wine, beginning with the choice of vineyards and most suitable areas. The first cru of Barolo bottled under the name of Michele Chiarlo dates back to 1958. Michele expands the boundaries of the market for wine. He was among the first producers in Piedmont to believe in the success of Italian wine abroad. Beginning in the mid-1960s, he worked tirelessly to break down the doors of the markets of Northern Europe and the Americas, earning the trust of importers and consumers across the world. In 1972 Michele Chiarlo consolidates its success. A larger, more functional winery is constructed in Calamandrana. Following the advice of his father – «have patience and make sacrifices, but only buy vineyards in important positions», Michele Chiarlo began to select the best parcels of land in Langhe, Monferrato and the area of Gavi. A meticulous and patient search which would lead him to the purchase of the most prestigious crus in Piedmont. Raising the quality of Barbera and with it, the value of Monferrato, his chosen land. This was the dream of Michele Chiarlo who was among the first to create in 1974 a Barbera using malolactic fermentation. Finally, a stable, grow-up wine whose rusticity, if duly managed would be the raw material for exceptional wines with international standing. Beginning with this success, Michele Chiarlo continued to invest and believe in the Barbera d’Asti, helping to spread its rightful reputation and value across the world. In 1987 Michele Chiarlo is among the historic founders of the Consorzio Grandi Vini, the first supraregional association of wine producers created to promote the exportation of quality Italian wines. Michele Chiarlo acquires parcels of land which produce the finest Barolo crus. Cerequio, in 1988, in village of La Morra; the following year in Cannubi, the hill “blessed by God” and perhaps the most historic, important and prestigious crus in Italy. Michele’s two sons join the winery: Stefano, to take care of the agricultural and oenological side, and Alberto in sales and marketing. In 1995 the Barbera finally has its temple. Michele Chiarlo acquires the Tenuta La Court, twenty extraordinary hectares in Castelnuovo Calcea, historic heart of the designation. Not only a place of production, but a laboratory where wine, landscape and community find a land about which to converse. It was La Court which gave birth to the passion and would increase the investments made by Michele Chiarlo and his sons in the Nizza Docg, the «Super Barbera» of Monferrato. In 1996 Michele Chiarlo is among the founding members of Hastae, an association of important producers of Barbera d’Asti, created to carry out new experimentation and promote this wine and its land to the world. Nizza – the great adventure begins. Together with oenologist, Giuliano Noè, Michele Chiarlo is among the pioneers of the new designation and the long battle for its recognition, crowned with the Docg designation, in 2014. In 2003 Art Park La Court is created inside the estate from which it takes its name. It is the first example of land art among the vineyards. In 2004 Michele Chiarlo had the honour of being selected to play a role in the Istituto del vino italiano di qualità Grandi Marchi, which gathered together 19 highly prestigious Italian companies, with the objective of promoting top range Italian wines across the world. In 2011 Palás Cerequio is born, the first relais dedicated to the cru of the King of wines, alone at the centre of a fine Barolo vineyard. In 2012 Michele Chiarlo is among the founders of the Accademia del Barolo. Michele, Stefano and Alberto Chiarlo continue to work, following the tradition of a family business with an international outlook. Attention to the details, maniacal care of the vineyards, vinification while respecting the terroirs and the vines, artisanship of the processes. Characteristics which make the winery in Calamandrana one of the most important oenological realities in Piedmont, firmly believing in the exclusivity and continued investment in indigenous grape varieties.